I find it interesting that instead of simply limiting how many college students they use, they specifically say no college students. So cool. This is like a sociology nerd test. If you are excited to see this, you might be a sociology nerd. This is a classic study in the notions of expertise, deferral and public perceptions of/engagement with science. Amazing that the original leaflet has resurfaced. I wonder what effect this study had on the participants - i.e. for those that cranked up to the full 450v and heard the tape go silent -what questions they asked / what their emotional response was afterwards. Pretty harrowing experience I'd imagine, as would working in a concentraiton camp, but in both cases, people still did it, and if questioned on their actions would probably attempt to distance themselves from the motivation for them by referring to more senior figures / experts in both cases. In the original experiment, were only men used as participants? I have to say that, reading about this experiment again, it occurs to me how unethical it seems. Inflicting guilt and an obviously traumatic experience on the subjects, all to prove... that people trust authority? Also, in the case of soldiers working in concentration camps, while obviously there were psychological dynamics at work, I imagine that the threat of violence also (whether subconsciously or not) contributed to the willingness to comply. 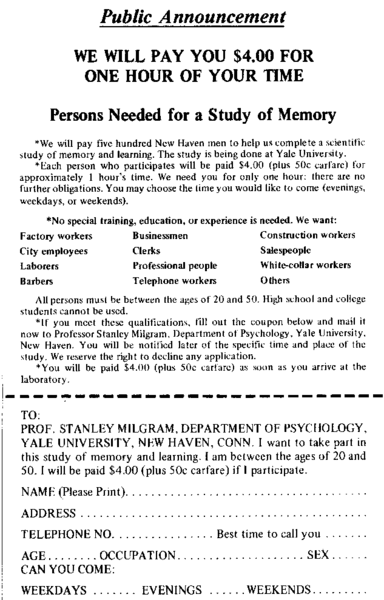 "none of the participants who refused to administer the final shocks insisted that the experiment itself be terminated, nor left the room to check the health of the victim without requesting permission to leave, as per Milgram's notes and recollections"
It seems that even when we do something that is against authority, we still somewhat follow their lead (creepy!). Anyone know if he queried the subjects for philosophical aspects - religion, political party? And how about race? Now, that's the kind of data that would turn this into a fresh hot topic. of course, it could be easily faked at this point, so the only folks that would believe it would be those it flattered. Reminds me of an experiment that I volunteered for back in 1970 at Stanford. It was supposedly an experiment in distraction. I was requested to press a button which would administer an mild, but annoying electric shock to a student taking an exam (and set off a really loud buzzer, of course). They assured me it would only cause a "tickling" sensation & even offered to let me feel the sensation. I declined, assuming they were telling the truth. The "torture" lasted about 15 minutes, with the student sitting across a table from me, "wincing" at the appropriate times. Afterwards, they told me that the real "test" was about whether or not I would press the button in the first place. Needless to say, I am not a sociologist. There's in interview floating around somewhere with the man who was the "student" - the actor who was pretending to be shocked. It was on the radio a few months ago, I'll see if I can track it down. Speaking of Stanford, this whole thing reminded me of the Stanford/Zimbardo Prison Experiment in the 1970s. Milgram's studies are constantly touted as evidence of how blindly we obey authority, but really... are they? In this case, obedience to the researcher's demands were likely rationalised as "he knows better". Perhaps it wasn't so much obedience as it was trust. The participants were RIGHT to trust the researcher - no harm was actually caused to anyone! So perhaps it isn't so much "I will cause another person harm just because someone in a position in authority told me to," but rather "I will do what the person in a position of authority tells me because they know something that I don't"
As much as Milgram "demonstrated" some phenomena with his studies, he didn't actually continue his research to include viable explanations for them. I studied this test in Psych last year; after completing the test, they did a follow up (6 months afterwards, I think). Even after knowing exactly what the test was about, only one or two of the participants felt guilt, remorse, regret or shame for their actions during the test. Maybe that's cognitive dissonance at work, or maybe they justified it by claiming they were only "following directions", but regardless, the results are still quite scary.